I captured this at about 5:30 this evening, just as I got home from work. Apparently, one of the craters toward the north side of Etna (I'm on the south) is shooting up these little gray clouds of ash. It's a nice contrast with the snow and the light of sunset. 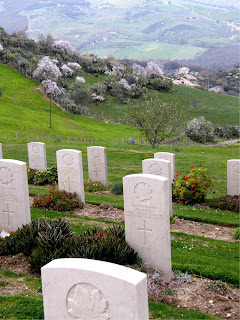 The British World War II Cemetery at Siracusa doesn't have the beautiful location of those at Catania or Agira. It's right on the highway going into south Siracusa, no great views in any direction. 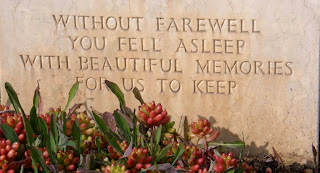 It is, nonetheless, a moving place to visit. Almost one thousand soldiers, sailors, and airmen are buried here. Like the others, most were in their early 20s and privates. There are Christians and Jews and Hindus, Australians and Canadians and Indians and British. There are engineers, pilots, sharpshooters, a chaplain, a diver, and quite a few unknown soldiers and seamen. A few markers simply say "A Victim of the War." The cemetery is being renovated, and right now it's got very little grass and a lot of mud. Three grave markers stood off to one side, not in the rows with all the others. They were markers for three men who were buried originally in other places were they fell and their original graves were lost. 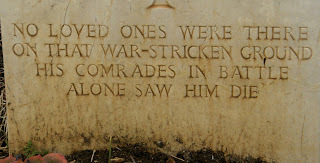 In a few places, a number of men were listed on the markers, apparently where groups of them were killed together. The fighting in this area took place primarily in July 1943, as that is the time period on nearly all the stones. Family members must have had the option to put lines near the bottom of the markers. Some are religious verses, some poetry, and some are personal. Today I took a lot of photos of those. It never fails to affect me in the same way . . . all of these men killed in the prime of life, or even before. War was not, is not, and never will be the answer. 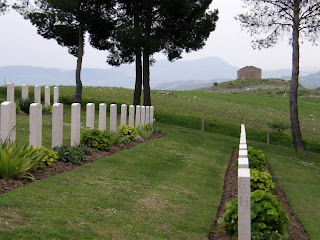 It's a bit off the beaten path but well worth the search to find the World War II Canadian Cemetery here in Sicily. I have never seen a more beautiful location, a fitting place for these 500 Canadians who gave their lives in Operation Husky in 1943. 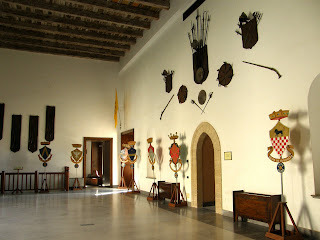 Most of them perished in fierce fighting around Mount Etna in the last week of July. They were part of the British forces who faced the strongest resistance from the Germans as they retreated north toward Messina in order to escape to the mainland (which many of them did). 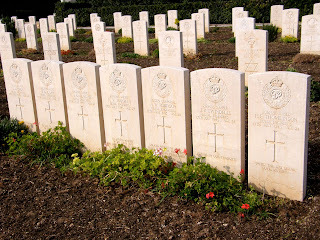 I'm not sure why the Canadian forces have a separate cemetery (the British ones are in Catania and Siracusa), as the same architect designed all three. But this one has location, location, location. 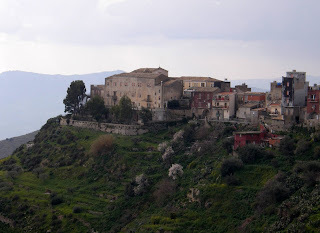 It sits high on a hill overlooking one of Sicily's few lakes and Mt. Etna to the east, the hill town of Agira to the west, and the gorgeous rolling hills and eventual plains of inland Sicily to the south. 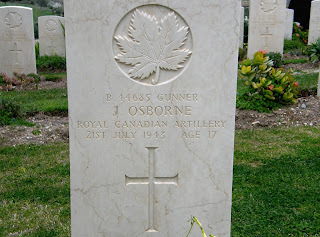 The stones are identical to the ones in the British cemetery in Catania, but with Canadian maple leaves on each one. Fallen service members from the French provinces have inscriptions in French. Like the Catania site, a large cross looms overhead, even though some markers have the Jewish star on them. 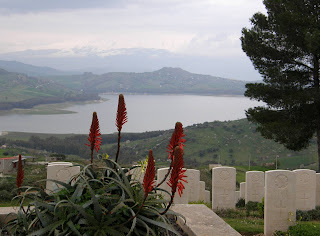 The oldest soldier buried here was 57, the youngest just 17. Some markers have been visited recently. I saw flags, a faded photograph, and a hat. That 17-year-old would be 82-years-old if he had lived. Even while we were there, two local families visited and went specifically to certain markers there. 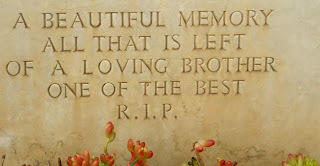 One more Allied cemetery is left to see in Sicily, the one in Siracusa. I plan to do that soon. I've had my eye on a mountain that looms in the west every day when I drive home. It is so high, I knew I had to find it and go to the top. I just knew there had to be a great view of Etna from up there. 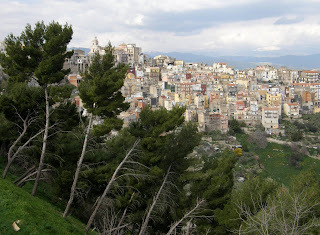 I did some investigating on my map of Sicily and narrowed it down to two peaks. One was a "scenic view" and the other not, so that made it easy . . . 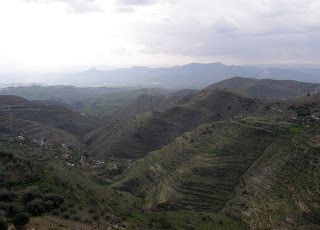 I wanted the scenic one, which lies across the Simeto Valley from Etna to the west. 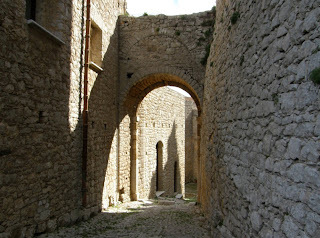 According to the map, the peak was 733 meters high (2,404 feet), and the town at the top was called Centuripe. I talked Kendra into driving, and her little Audi convertible was up to the task, zipping up the switchbacks without hesitation. Like many of these remote Sicilian villages, the streets were narrow, crooked, and two-way when they should have been one. 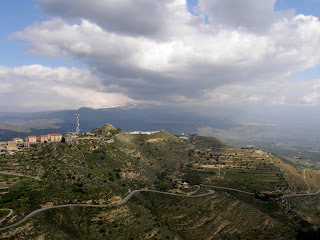 Nonetheless, we found a place to park that was close to the best views of Etna and the surrounding countryside. I swear we could have seen Africa if it had been a more clear day! Centuripe rates only a few lines in the Eyewitness Travel Guide. There isn't a lot to see there but the views are spectacular. Once upon a time, this was an important Greek-Roman town. How THEY got up there, I don't have a clue! 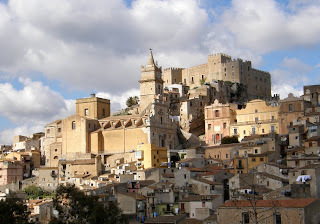 It is known as "the balcony of Sicily," a great name for a town with view. 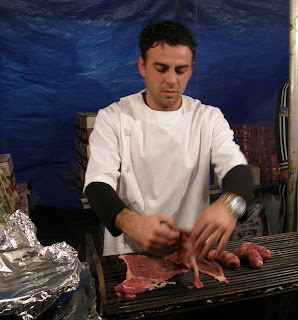 In Sicily, horsemeat is a common meat right up there with beef, pork, and lamb. In the big supermarkets, it's just another meat counter, labeled EQUINE. 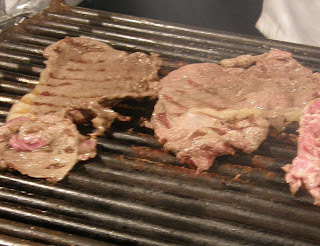 Many people really like the meat, as it is very lean and free of hormones and other things they have in beef and pork, for instance. There are all kinds of cuts (see butcher photo in a horsemeat shop), but it seems best cut very, very thin and then grilled briefly, just enough to cook it. That is how we had it, on crusty bread, at the Agatha festival in Catania last week. Where they get the horses, I have no idea, but I've never seen them being raised, only used for racing or farming or pulling Sicilian carts. My friend Michael says, "I don't eat Flicka." Of course, he doesn't eat rabbit either. 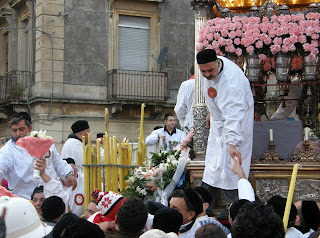 Finally, in my fourth year in Sicily, I got to see Sant' Agata (Saint Agatha) in Catania! It was all I had hoped for and easier than I imagined. Sant' Agata is the patron saint of Catania, a legendary Catholic saint of rock star proportion, who brings out well over a million people to see her for three days every February. Agata was an early Christian virgin from a wealthy family who refused to give up her Christian beliefs even when she was horribly tortured by the Roman governor (who wanted her) at the time. Her breasts were cut off, and this is often portrayed in statues (on a plate) and even as cookies that are made at this time of year. Eventually, she was condemned to be burned at the stake, but a violent earthquake occured and the local Catanians took it as a sign from God to stop the execution. She was brought back to her prison cell (enshrined in a local church on Via Agata) and she soon died there. The year was 251 A.D. Her body was returned to Catania from Turkey in 1126. Since then, Agata has intervened and saved Catanian and it loyal citizens many times, from earthquakes, the volcano, war, and more. 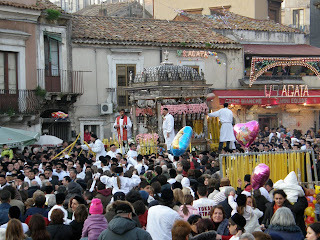 The three day festival of Sant' Agata consists of many events, but all revolves around a 24-hour-a-day procession of the relics of the saint and a bust of her semblance being taken all around the city on an ornate carriage pulled by hundreds of robed devotees pulling it with long, long ropes. It is considered a great honor to be one of these. (Note: Until recently, it was only men who performed this, but now there are a few women doing it, too.) As she goes around the city, various religious events occur at certain places until she is brought back to her silver secured room in the cathedral and locked away for another year. My friend Jan Sibayan is the one who finally got me to see Agata. The first year I was here, it passed before I knew what it was, the second was horrible weather, and last year the soccer riots practically stopped the whole thing. Jan and I left school as soon as we could on Monday and got downtown early. After a cappucino at the Bar Kennedy, we found a great position in the Piazza Carlo Alberto where the main Catania market usually is and waited with hundreds of others for the procession. 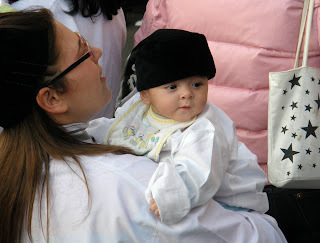 The atmosphere was festive with singing, vendors, families, and an air of expectancy. 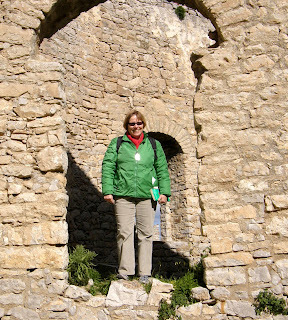 I had the feeling that many of the people were parishioners of the Church of the Carmine, on whose very steps we found a great place to wait for Agata. 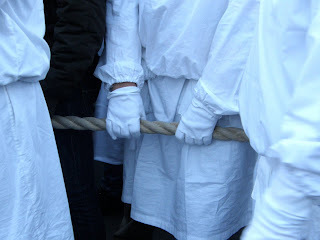 When the procession appeared, some time after 4:30, many people took out white handkerchiefs and waved them in the air, which is symbolic of the return of Agata to Catania. 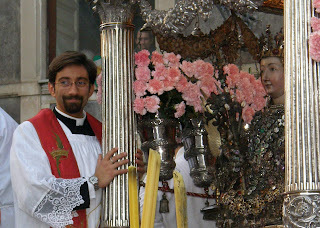 They stopped right in front of the church, and us, for prayers, speeches, fireworks, crowd cheering, and the passing of candles, flowers, notes/interecessions, and even babies onto the 16-foot long silver "Vara" carrying the statue and relics of the saint herself. The purpose of these actions is to give thanks or ask for help from Agata. A priest and several robed helpers were there to collect all the stuff from people. This went on for quite a while and the towers got a little rest. We then walked further into the heart of the city and the route the saint would be taking was lined with thousands as it began to get dark. Many people were on the sides of the street that passed her prison cell and went up a hill. Apparently it's really something to see them pull the very heavy Agata carriage up this hill. We saw Agata's carriage again later, from a distance, and experienced more fireworks. The city is decked out during these days with the traditional festa lights and lots of vendors with souvenirs, candles, and food. I already can't wait for next year. "Viva Agata!" See all photos from this event HERE.